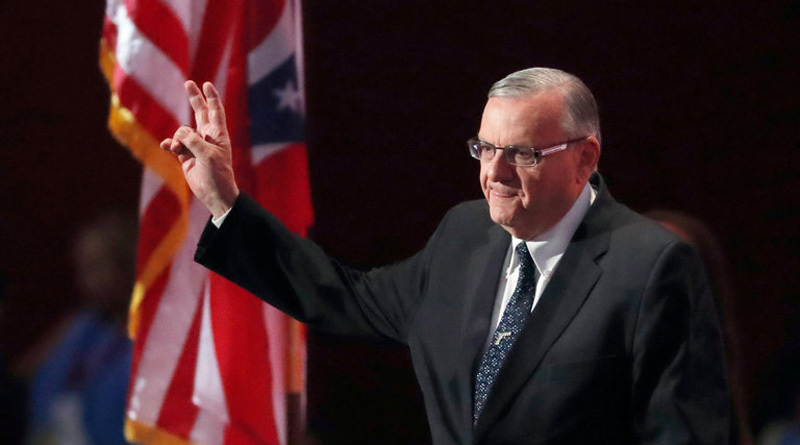 U.S. President Donald Trump on Friday granted a pardon to former Arizona lawman and political ally Joe Arpaio, the self-proclaimed “toughest sheriff in America,” less than a month after he was convicted of criminal contempt in a case involving his department’s racial profiling policy. Trump had signaled this week that the first presidential pardon of his administration would go to Arpaio, 85, whom he has frequently praised for his hardline immigration stance. “Sheriff Joe Arpaio is now eighty-five years old, and after more than fifty years of admirable service to our Nation, he is [a] worthy candidate for a Presidential pardon,” the White House said in part in a press release. The White House said Arpaio exemplified “selfless public service” throughout his life and career. “Throughout his time as Sheriff, Arpaio continued his life’s work of protecting the public from the scourges of crime and illegal immigration,” the release said. In 2013, a U.S. District Court judge ruled the county’s actions to be discriminatory and in violation of the Civil Rights Act. This led to a contempt charge when Arpaio’s office refused to yield on its conduct. He has yet to be sentenced after being found guilty on July 31. Arpaio also garnered widespread attention for housing inmates in an extension of the Maricopa County jail known as “Tent City,” issuing prisoners pink-colored underwear and holding multiple press conferences to allege that President Barack Obama’s birth certificate was fraudulent. Arpaio endorsed Trump’s presidential candidacy in January 2016, going on to appear at campaign events with the businessman-turned-politician and eventually speaking at the Republican National Convention. Despite his elevated national exposure, Arpaio was defeated in his own election in November by an almost 13-point margin. Thank GOD! Now, Trump needs to show some REAL GUTS and have Attorney General Sessions appoint a Special Prosecutor to pursue the Hillary Clinton felonies, and Obama’s use of his National Security Agency to spy on Republican rivals, and then distribute the data to his political operatives like that lying nig, Susan Rice.